Visit some of England’s most beautiful towns and countryside on this 12-hour tour of Stonehenge, Bath, the Cotswolds and Stratford-upon-Avon. Travel out of London by luxury coach to the prehistoric site of Stonehenge, and onward for a panoramic tour of Bath — both UNESCO World Heritage sites. Continue on with your guide through the Cotswolds countryside to the historic town of Stratford-upon-Avon. Enjoy a visit to Shakespeare's birthplace, with Champagne and scones served in his picturesque garden. Combine vibrant history, gorgeous scenery and sightseeing at some of Britain's most popular attractions. Please note: As of April 1, Shakespeare's birthplace will be replaced with a visit to Shakespeare's Schoolroom, with Champagne and scones included. Depart from near Victoria Railway Station in central London and leave the hustle and bustle behind you as you travel out into the English countryside by luxury coach. Sit back, relax and enjoy the ride as London’s urban scenery gives way to the open greenery of the countryside. First, head through the rolling Wiltshire plains to the UNESCO World Heritage site of Stonehenge, widely considered one of the most famous prehistoric monuments in the world. The enormous stones are believed to have been brought from the Preseli Mountains in Wales — a distance of over 280 miles (450 kilometers) — sometime between 3,000 BC and 2,000 BC, though to this day nobody is sure of the exact reasons for their arrangement and placement. Marvel at the huge stone circle, discover the many mysteries surrounding it and decide for yourself why Stonehenge was built. Continue onward to the fine city of Bath, birthplace of authoress Jane Austin. Explore the beautiful UNESCO World Heritage-listed city — considered by many to be one of the prettiest cities in England — with your guide, and enjoy capturing its attractive Georgian architecture, crescents and terraces on camera. After your tour, enjoy a little free time to wander the cobbled streets and peruse the shops at your leisure. Head north from Bath through the heart of the Cotswolds, widely thought of as one of the most beautiful stretches of countryside in England. Take in breathtaking views of open fields criss-crossed by dry stone walls as you travel, and bustling market towns with magnificent churches. Enjoy the spectacular scenery from the comfort of your coach. Arrive in the charming town of Stratford-upon-Avon, birthplace of William Shakespeare and home to the world-renowned Royal Shakespeare Company. Stratford is a charming market town set in the heart of rural England, with a delightful river winding its way slowly through the town. Enjoy Champagne and scones in Shakespeare's garden (the reception will take place indoors in winter), stretch your legs and explore Stratford to soak up the town’s wonderfully welcoming atmosphere. As of April 1, Shakespeare's birthplace will be replaced with a visit to Shakespeare's Schoolroom, with Champagne and scones included. At the end of your time in Stratford-Upon-Avon, hop back in your coach for the return journey to London, where your tour will conclude. Please note: during busy periods the order of the itinerary may change. See London on a full-day sightseeing tour of the city, led by a guide. Hear the history of top London attractions like Westminster Abbey and Big Ben, and receive fast-track entry and a guided tour of St Paul’s Cathedral. After the sightseeing tour, watch the Changing of the Guard Ceremony at Buckingham Palace and tour the Tower of London. As a bonus, this experience also includes a one-way River Thames sightseeing cruise, which can be used on the day or another time. Upgrade to include a flexible London Eye ticket to be used on any day you wish. Meet your guide on board your air-conditioned coach, and then relax as you travel around central London to see the sights. Pass through Parliament Square, seeing the Houses of Parliament and the Big Ben clock, and then travel past Westminster Abbey where Prince William married Kate Middleton in a lavish royal wedding ceremony. Admire prestigious government buildings at Whitehall and Downing Street, and then see the hustle and bustle that surrounds Nelson’s Column at Trafalgar Square. Travel to Buckingham Palace, the official London residence of the Queen, and walk around in front of the gates to see the famous Changing of the Guard ceremony. Have your camera ready to capture the pomp and pageantry of the Queen’s Foot Guard as they march in their eye-catching red tunics and bearskin hats, and then travel by coach to a traditional London pub in Trafalgar Square. Rest and refuel with a hearty lunch (own expense), and then continue your day of sightseeing with a visit to the City of London, an area just east of the city center where many of London’s banks can be found. Look out for the sights as your guide explains their history and hop out for fast-track entry and a guided tour of St Paul's Cathedral. Continue to the Tower of London, and head inside to explore at your leisure. The former prison and fortress, which looks out over the River Thames, was built to terrify potential invaders and Londoners alike. Steeped in centuries of murder and treason, the tower is fascinating to explore with its famous jet-black ravens and Beefeater guides. Should you wish, opt to join one of the complimentary Beefeater tours that run every 30 minutes and hear tragic tales of the royals and nobles who met their end within the tower’s walls. Our private One Day London Tour is completely customizable. Typical itineraries follow a theme: from royal London, to art and collectors, architecture, urban planning, or those just looking for the best food in the city, our team of experts can accommodate nearly every request. With a network of local experts on the ground we can design a private tour of London on a wide range of topics. However, before requesting a custom tour, you might want to take a look at our full list of London walking tours—chances are, we've likely thought about it. For example, if you're looking for a solid introductory walking tour of the city, take a look at our London City Tour. Or, art lovers should consider our Tate Modern Tour, which provides a art historian-guided introduction to the legendary Vatican Museum. We also offer a London Food Tour, introducing visitors to traditional English fare and historically important shops. Please note that clients requesting a full day that includes either the Tower of London or the Royal Mews will be charged for advance tickets in order to avoid lines at the time of the tour. If you are interested in visiting Buckingham Palace, keep in mind that the palace serves as both the office and London residence of Her Majesty the Queen. Visitors are only allowed during specific times of the year - normally during the summer. South West England is rich in history and natural beauty. From the mysterious stones of Avebury and Stonehenge, to the Uffington White Horse, Bath, and the Salisbury Cathedral, there is a wealth of astonishing sites to take in. Our full-day Stonehenge Tour including Bath and Salisbury, led by a local historian and designed as a day trip from London, offers a glimpse of a deeply distinct part of England. Together, we'll explore the history, mystery, and profound beauty of this region. Arriving by train from London, our exploration of the South West will begin from Salisbury station. Here we will meet our docent and driver and proceed to Stonehenge, just in time for its opening to the public, in order to beat the crowds and enjoy the view of the stones in tranquility. In the company of our expert, we will engage in the ongoing discussion regarding the origin and significance of the stones, while learning to distinguish historical facts from well established traditions. We will also have time to walk in the archaeological park and take in the ethereal magic of the site. From here, we'll depart for our next stop, which depending on the day and the clients preference may be Bath (where we also have a standalone Bath Tour) or Salisbury Cathedral, but not before stopping in a local country pub for lunch. We may taste some of the local ales and indulge in traditional dishes such as game pies or a simple ploughman's lunch. After lunch, we'll proceed to the second part of our exploration. Looking for another day trip from London? Try our Cambridge Tour. If heading to Bath, we'll stroll through the Georgian streets while learning about the city's Roman origins and its later connections to the dandies and fashionables of London. Our docent will explain the role of the Roman Baths and how they are still today a fundamental fixture of the town. If we feel inclined, we may proceed inside and visit the Baths before taking the train back to London at the end of the day. In Salisbury, our visit will focus on the Cathedral, home of the Magna Carta and exquisite example of Early English architecture. We will talk about the Cathedral's musical history and tradition dating back to the foundation of the church in 1258, as well as its role in innovation (the Salisbury Cathedral was the first English cathedral to recruit girl choristers in 1991). Our discussion will cover the once thriving town of Old Sarum and Salisbury's original cathedral, now only visible in its outline. We'll learn how many of its stones were re-used in the construction of the new building and why both city and cathedral moved from their original location to today's one. As our day together comes to a close, we will have uncovered what makes South West England such a rich destination to visit: lesser-known charms, incredible landscapes, beautiful architecture, and the memorable UNESCO World Heritage Sites of Stonehenge and Avebury. At the end of the day, we'll return to London on one of the many direct trains that run between the two locations. Please note: You will meet your docent and driver in Salisbury (we will provide detailed instructions). In general, the full-day excursion has you back in London by 8:00 pm. If you are staying in Bath, Salisbury or anywhere outside of London, please let us know and we can assist you with transport information. Note that we can also conduct a two-day extended excursion (private). You will be responsible for purchasing train tickets at the station. Included in your confirmation will be details regarding which trains to take and how to book. If you prefer to travel by car from London, we can arrange for a full day car service. Please leave a note to this effect in your booking. Can I see the inside of Stonehenge? Although not possible during normal opening hours, you may visit the inside of Stonehenge by pre-booking with Stonehenge Circle Access. Visits take place in the early morning or late evening only and last for one hour, with a maximum of 26 participants on each visit. Stonehenge Circle Access should be booked well in advance of when you plan to visit. Those interested in booking must complete an Application Form. The cost of the ticket for accessing the stones is about 38GBP per person. Depending on the time of the year, early morning visits take place at 6:30-7:30 or 8 AM. Please include a note in your booking if you are interested in this option. You will meet the docent and driver at the Salisbury train station. Trains are very easy to use and navigate in the UK. We suggest the 8:20am train from London Waterloo, to get you to Salisbury by 9:45am. From there you will proceed by private car that we've arranged for you. The day will end in Bath or Salisbury, depending on your preference, where the driver will drop you off at the Station. From there, you will catch the train back to London. Your confirmation email will have more information, the exact meeting point, along with a map and emergency phone number. Can I arrange for private car service beginning and ending in London? Your guide will meet you at a designated central location. Walk in the footsteps of the rich and powerful. You'll be introduced to the personalities who ruled Great Britain, from Edward the Confessor to Thersea May. You will be taken to see where they lived, worked and played, as well as where many are entombed today. Start by visiting one of the most well known landmarks in the world, Big Ben and explore the political and social heart of London. Get your camera ready to take pictures of The Houses of Parliament and Westminster Abbey. Hear stories of treason, Royal weddings and the political system. Make your way through one of the most beautiful parks in central London- St James, with its lake and wildlife to keep you entertained. Once you step out of the park you will see Buckingham Palace and St James Palace. Arrive in time for the impressive Changing of The Guard, something no tourist should miss. Next the tour will make its way to Trafalgar Square where you will see and learn of one of the greatest Naval leaders this country has seen- Admiral Horatio Nelson. At this point there will be time for a short break in an area renowned for street entertainers and world class restaurants and great street food. Possibly head into Soho home to little Italy, and cuisine from around the world. Ask your guide for a suggestion or where the best coffee is found (own expense). Board one of the famous red London buses (own expense) and pass by the Bankers and lawyers and hop off at the centre of the financial city where St Paul's Cathedral stands.Stroll down the beautiful South bank river passing by William Shakespeare's Globe Theatre, Tate Modern, St Paul's Cathedral, The Shard and the greatest food market London has to offer, Borough Market. Here you can treat yourself to great coffee, wine, locally crafted beer or cake (own expense). Cross the famous London Bridge where there will be a photo opportunity of the most famous bridge in the world, Tower Bridge. Once across, arrive at the 11th century Tower of London where the Crown Jewels are kept and home of the Yeomen Warders or more commonly known as Beefeaters. A place built as a fortress to protect London and England. It is here that the tour will end, your guide will answer any questions and direct you to where you want to go. Travel through 5,000 years of history on this full, 10.5 hour day-trip through West England. You’ll have the chance to explore the largest prehistoric stone circle in Europe with your small-group of no more than 6 people. Get time to take in the Tudor buildings of Lacock, and learn fascinating facts about the Roman influence on the beautiful city of Bath. Your local, professional guide will make your day an unforgettable journey through the most important and impressive history of England. Meet at 9am for your departure at 9:15am from the Greenline Coach Terminal, on an air-conditioned coach, you will head west out of London through the county of Wiltshire to our first stop of the day, the ancient Roman Spa town of Bath. This city has been inhabited for around 2000 years. There’s Roman baths, Georgian architecture, and a gorgeous abbey to see. It’s a fascinating town to explore, so you'll have plenty of time to wander around at your own pace. After lunch, you'll travel deeper into rural Wiltshire to Lacock village, famous for its picturesque streets, historic buildings, and role as a television and film location. With your local, professional guide, you'll learn about, Abbey, in the heart of the village has its own woodland grounds, and is a quirky country house of fascinating architectural styles. Your final stop of the day is at the pretty village of Avebury. Here you can wander amidst the largest prehistoric stone circle in the world. You return to London in the early evening, approximately 7:30pm, then dropped off at your original departure point.. Explore the UNESCO World Heritage–listed attractions of Bath and Stonehenge on this full-day tour from London. Travel by coach to the prehistoric monument of Stonehenge and — with your audio guide to hand — gain insight into the sites historical significance. Afterward, visit the Georgian city of Bath — widely considered among England’s prettiest cities. Explore the ancient streets with your guide and discover top attractions including Bath Abbey, the Jane Austen Centre, and the Royal Crescent. This tour includes guide, entrance fees and round-trip travel from London. Hop aboard your coach in central London in the morning, then relax on route out of the city to the UNESCO–listed site of Stonehenge. Located in the pretty English county of Wiltshire, Stonehenge is considered by many to be among the world’s most impressive prehistoric sites. On arrival, enjoy a 1.5-hour tour with your audio guide and admire this ancient monument up-close. Gain insight into the site’s fascinating history and perhaps come to your own conclusions on the origins of the ancient rock formations. Travel onward to the Somerset city of Bath and follow your guide on a walking tour through the UNESCO–listed Georgian streets. Along the way, take in top attractions such as Bath Abbey, Bath Circus, the Jane Austen Centre, and the beautiful Royal Crescent, and learn of Bath’s interesting history. When your time in Bath comes to an end, return in comfort to central London to conclude your tour. You will visit Windsor and Eton in the morning before traveling to Oxford at lunchtime where you will spend the afternoon. In the Oxford centre you will find a wide range of shops in the Westgate and Clarendon shopping centres and the old Victorian covered market. Or you can visit some free museums or Oxford Castle at your leisure. The ‘City of Dreaming Spires’ is home to one of the most famous and oldest universities in the world. For over 800 years it has been a home to royalty and scholars although people are known to have lived in the area for thousands of years. Its beautiful architecture, museums and young student population make the city a wonderful place to visit at any time of year. Even though Oxford is a very cosmopolitan city, it is dominated by its ancient university, with each college having its own sense of identity. With its mix of ancient and modern, there is plenty for the visitor to do. If you are a keen photographer, or you just like seeing things from a different angle, then why not climb the 13th century tower of St. Mary the Virgin Church opposite the Radcliffe Camera. The church is known as the university church and is the oldest building associated with the university, for a small fee you can climb the steps of the tower for wonderful views of the college buildings. Oxford has a great collection of museums; The Museum of the History of Science contains scientific instruments from medieval times up to the modern day. The Pitt-Rivers Museum houses the university’s archaeological and anthropological collections. The University Museum is the museum of natural history; it is situated next door to the Pitt-Rivers Museum. See the best that England’s capital has to offer on a full-day city tour of London! Explore St Paul’s Cathedral with a guide, then make a photo stop at Westminster Abbey. Watch the must-see Changing of the Guard ceremony outside Buckingham Palace and have some free time for lunch around the UNESCO-listed Tower of London. Finish up with a sightseeing cruise down the River Thames. If you want to see even more, upgrade to one of two activities: an afternoon tea on a boat on the Thames, or a London Eye flight. Start your day with pickup at the Victoria Coach Station in central London, and then travel by air-conditioned coach to St. Paul's Cathedral. Spend the morning there, then travel to Westminster Abbey where Prince William married Kate Middleton in a lavish royal wedding ceremony in 2011. Pose for photos outside the Gothic crowd pleaser. Head to the Mall outside Buckingham Palace to watch the legendary Changing of the Guard ceremony. Accompanied by a military band, soldiers from the Queen’s Foot Guard march in time to drumbeats, performing a ceremonial ritual that dates back centuries. 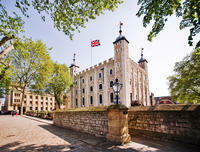 Move on to the Tower of London, a former prison, fortress and UNESCO World Heritage Site. Visit sites like Traitor’s Gate, the Torture Exhibition and, of course, the glittering Crown Jewels – a collection of irreplaceable and historic items. Spend some free time here exploring and eating lunch. Hop aboard a sightseeing boat for a short trip down the River Thames. Cruise down the river, looking out for the top London attractions such as Shakespeare’s Globe, and then step out onto dry land. Your expert guide will take you to the actual sites used in the filming of many of the Harry Potter movies. This is the best tour for any Harry Potter fan as you will be able to walk in the footprints of the stars themselves. You will enjoy free 4G WIFI to use all day inside the vehicle, as well as free drinks and snacks. You will even get to stop at a secret place along the way to ensure you really get that WOW factor! Your guide will know all the best places to stop and get that perfect photo and will even take them for you to make sure all of your group is in the photo together. The tour will start at 8.45am with collection from your accommodation. Your guide will tell you all about the history and legends of each site visited, and will entertain you as you drive around the country with stories and legends of UK history, life and culture. You will visit the city of Oxford and head to Christchurch College first, normally taking one hour. This college, the most famous site in all the Harry Potter movies, has the real great hall used in the movies, and the staircase used at Hogwarts. From there it’s onto the Bodleian Library to visit the Hogwarts Infirmary and Hogwarts Library. Along the way you can spend some time shopping in some of the cities famous stores should you wish to get any Oxford University items or Harry Potter memorabilia. The guide will stay with you all the time and guide you around all the sites and point out many other facts and points of interest the city and colleges have to offer. From here we’ll stop at the prefect lunch stop, the same pub frequented by the famous authors, normally with one hour to eat (own expense). The final stop on our tour is the stunning ancient English Village of Lacock which should take around two hours. This village has the amazing Lacock Abbey within it and this contains the real corridors used for the school of Hogwarts and the classrooms used for the films. This cannot get any better for any Harry Potter fan but yet it does. Also within the village sits the tiny cottage used by Harry's father and mother where they battled the evil Voldermort and where Harry got that famous scar. Again the guide will stay with you all the time and tell you all you need to know about the old and famous village. After this exciting day of wizardry, we’ll then travel back to London taking about two hours depending on the local traffic with the tour ending at approximately 730pm. Marvel at two of the most impressive stone circles in Europe and discover the history and mystery behind these UNESCO World Heritage sites. In addition to visiting Stonehenge and Avebury’s Neolithic Stone Circle, wander the historic city of Bath and absorb its Georgian architecture, or enjoy an optional visit to the famous Roman-built baths. Afterwards, take in the medieval atmosphere of Lacock village, which has been made famous by multiple TV shows and films. Your driver/guide will transport you between sites via a luxury, air-conditioned, 32 seat, USB and WIFI enabled minivan on this full-day tour from London. Meet outside of Caffe Nero and depart at 9am to experience England through its spectacular scenery, culture, and history. With your driver/guide, head to Stonehenge (additional fee) and enjoy the incredible visitor center before getting a closer look at the stones. An optional walking tour of Stonehenge will also be available. Next, you will visit the stunning city of Bath, another UNESCO World Heritage site famous for its Georgian architecture and Roman-built baths. During this stop you will have free time for lunch and the opportunity to take part in an optional walking tour of the city. Moving forward, the tour will head over to Lacock; a pretty, rural village which has been the film set of many award-winning productions such as Harry Potter, Pride and Prejudice, and Downton Abbey. Your final stop of the day will take place at Avebury, Europe’s largest neolithic stone circle. The stones here surround the village and there are no restrictions, therefor you can wander freely amongst the magical stones. Return to the original departure point at approximately 8pm. This is the perfect day away from London to Canterbury, Dover and Leeds Castle. Your incredible driver-guides will make history come alive through the day whilst on our luxury mini-bus and as you tour Canterbury by foot on an optional complimentary walking tour! The day begins as you leave London and journey towards Canterbury, home of Geoffrey Chaucer's Canterbury Tales. Enjoy your guide's storytelling as you make your way to the world-famous cathedral city. The cathedral dates back to 597AD, and you can’t help but be taken back in time in this city steeped in history, with Roman and Norman ruins and streets dotted with pretty timber-framed 16th and 17th-century houses. The route continues to the closest point to France on mainland Britain, Dover. Here you can walk along the iconic White Cliffs. With spectacular coastal views, this is a must-do to truly experience the incredible English landscape. The final stop is Leeds Castle and Gardens, where you’ll be able to step straight off the bus and start exploring! A castle has stood on this breathtaking spot, built upon two islands in a lake, since 1119. Your guide will share the castle's incredible history, it has notably been a Norman stronghold, the private property of six of England’s medieval queens and a palace used by Henry VIII. Now it is one of the most visited properties in Britain. This incredible day tour offers the perfect mix of history and scenery for a day away from London, and you'll arrive back around 6:30pm. Marvel at two of the most impressive stone circles in Europe and discover the history and mystery behind these UNESCO World Heritage sites. In addition to visiting Stonehenge (entrance fee included) and Avebury’s Neolithic Stone Circle, wander the historic city of Bath and absorb its Georgian architecture, or enjoy an optional visit to the famous Roman-built baths. Afterwards, take in the medieval atmosphere of Lacock village, which has been made famous by multiple TV shows and films. Your driver/guide will transport you between sites via a luxury, air-conditioned, 32 seat, USB and WIFI enabled minivan on this full-day tour from London. Take in two of England’s top UNESCO World Heritage–listed sites on this private full-day tour of Bath and Stonehenge from London. Follow a private guide through the cobbled streets of Bath and learn what attracted the Romans here 2,000 years ago. Take in top attractions such as the Roman Baths and Pump House, and admire traditional Georgian architecture along the 18th-century Royal Crescent. Then, delve into the Wiltshire countryside to prehistoric Stonehenge and hear the theories behind the stones’ construction. This tour includes round-trip travel from London with English speaking guide. Meet your private guide in central London in the morning, or start your tour with a pickup at your London hotel. Then, take a seat in your vehicle and relax on the onward journey to the UNESCO World Heritage–listed city of Bath. On arrival, explore the pretty streets as your private guide sheds light on over 2,000 years of Bath history — from the Roman era to today. Along the way, admire fine examples of Georgian architecture such as the famous 18th-century Royal Crescent. Discover stylish boutiques among the historic markets, and take in top city attractions like the restored Roman Baths and Pump House. Learn how the city’s thermal waters attracted the Romans and stroll along original Roman streets. Next, travel onward to the Salisbury Plains, home to the UNESCO–listed stone circle of Stonehenge — widely considered among the world’s most fascinating prehistoric sites. Learn of the stones’ mysteries in the state-of-the-art Vistors’ Centre, then take the short shuttle journey to the stones themselves. Walk around the ancient stone circle and perhaps decide for yourself the reasons for its creation. Soak up the spiritual atmosphere, then transfer back to your London hotel via the beautiful Wiltshire countryside.